This article was updated in July 2016 to reflect updates to Android Butter Knife. Creating code can sometimes be frustrating. Developers have to deal with redundant coding that is visually unattractive. In this article, I will introduce an injection library for Android development that can help create more beautiful code and recent updates introduced with version 8. Android Butter Knife is an open source view “injection” library for Android created by Jake Wharton. Butter Knife is small, simple and lightweight, and it makes life as a developer easier. It allows developers to perform injection on arbitrary objects, views and OnClickListeners so they can focus on writing useful code. Consider Android Butter Knife a reduction library. It replaces findViewById with @Bind() and set^^^^Listener calls with @onClick() making code cleaner and more understandable. Butter Knife enables focus on logic instead of glue code and reduces development time by reducing redundant coding. Before getting started with Butter Knife, you need to configure your Android project. Open build.gradle(Module:app) (module level) and add the following dependencies. In both the cases Butter Knife binds to the specified Android Activity or View targets to correctly act on the injections specified in these classes. All the view finding lines of code and the action listeners are implemented elsewhere, leaving these methods as clean as possible. Butter Knife replaces the standard findViewById call with @BindView, followed by a view ID and it automatically casts the corresponding view in the corresponding layout. This representation of the code makes it more compact and readable. You can do the same with app resources like String, Drawable and dimensions (dimen, value , etc). Here are all the possible bindings with Butter Knife. Butter Knife also makes setting event listeners of Android layout Views easy and removes the listeners implementation from the key onCreate and onCreateView methods. This isn’t restricted to click events, here are all the other events you can set. For the rest of this tutorial, I will focus on injecting Butter Knife features in Material Design views and components. Open Android Studio and create an application with a Basic Activity. 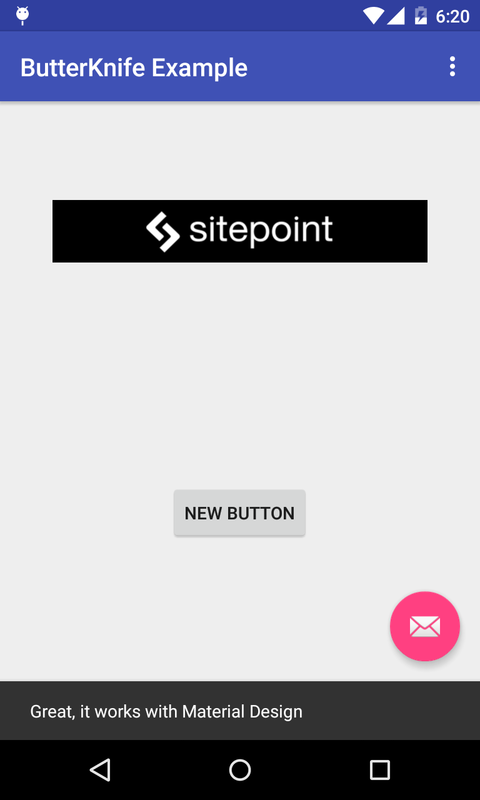 What better component to test with than the FloatingActionButton. And as you can see in the image below it works as you would expect. Butter Knife works well with list adapters, but can it also work with other Material Design similar components such as the RecyclerView adapter? The process of building a RecyclerView is long and complex, so I recommend you first read my article explaining how. I will focus on the parts of the RecyclerView related to Butter Knife, the ViewHolder and view binding. The full code of this example is available on GitHub. The ViewHolder example of a RecyclerView looks like this (In Recycler_View_Adapter.java). This ViewHolder class represents one row of the RecyclerView with the following layout (row_layout.xml). In an Activity class bind the RecyclerView and provide data to its Adapter (In MainActivity.java). 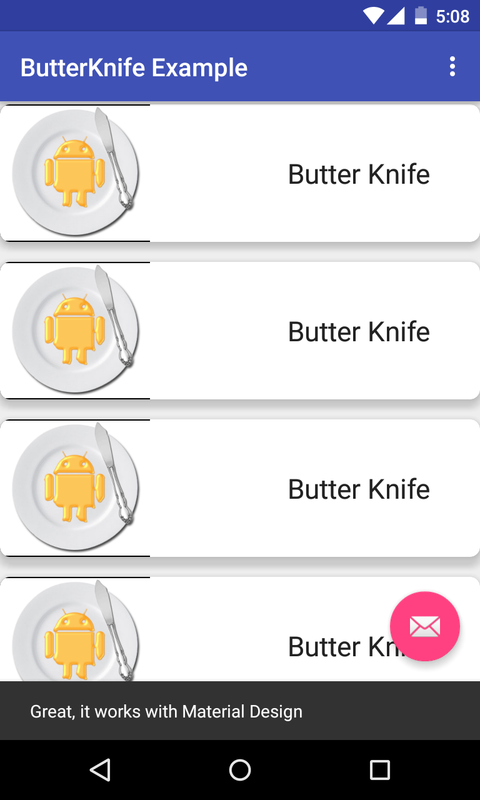 Android Butter Knife helps you create cleaner and tidier code, handling a lot of the ugly boilerplate code that Android has become infamous for. Have you tried in your projects? I’d love to know if you found it useful or not.